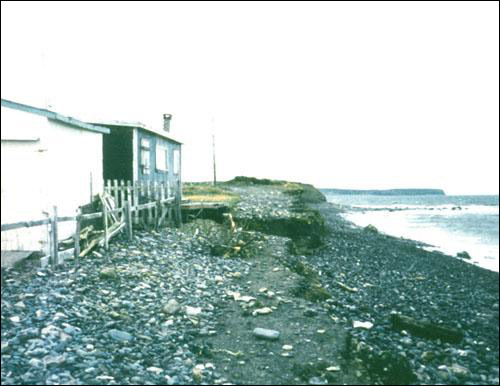 Coastal erosion may be a rapid process wherever the coastline consists of unconsolidated material, and is a geological hazard when development occurs as well. Coastal erosion commonly involves the destabilization of cliffs following wave impact during storms, but may also include ground- or surface-water effects from development adjacent to the coast. A beach and embankment along the shores of Chamberlains, Conception Bay. Taken shortly before a series of storms in 1992. Reproduced by permission of Martin Goebel © 1992. A beach and embankment along the shores of Chamberlains, Conception Bay. Taken shortly after a series of storms in 1992. Point Verde consists of a gravel peninsula at the entrance to Placentia Road, southwest of Placentia, Avalon Peninsula. The peninsula protects Placentia from some of the effects of major storms, and hosts a few houses, a gravel-pit operation, and a light station. The peninsula is joined to the mainland by barrier beaches. The sea cliff is eroding at a rate estimated between 0.5 and 2 m/year, based on aerial photograph analysis and monitoring sites. Several structures relating to the light-station have been lost. 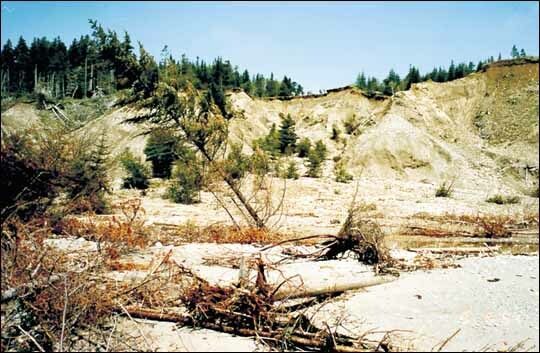 Further cliff erosion combined with extraction of gravel may result in the loss of the gravel-pit operation, and increase the flood risk in the communities of Point Verde and Placentia. The stretch of coast lying between Stephenville and the Port au Port Peninsula has seen increased development in the last few years. The coastline in this area consists of steep (up to 30 m) cliffs of sand and gravel that are retreating at an unknown rate. Encroachment of house construction into the cliff edge area has resulted in increasing concerns regarding property loss. The provincial Geological Survey has visited the site in recent years at the request of the local council. The Atlantic Geoscience Centre of the Geological Survey of Canada contracted a detailed photogrammetric survey of this area to evaluate erosion rates. 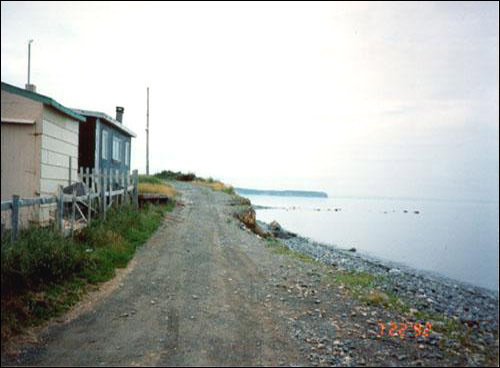 Following a period of heavy rain in May 1994 rapid forward expansion of a gully occurred at Port au Port East. Landslide in coastal cliffs at Port au Port East that occurred in May 1994. Reproduced by permission of Martin Batterson © 1994. The slide area measured about 150 by 200 by 30 m, and ended about 50 m from the nearest structure. A large debris fan was formed on the beach. Two smaller failures also occurred during the same storm, 500 m and 1300 m west of the main failure.